Penna Dexter is a radio commentator and columnist for various Christian conservative outlets. She co-hosts Point of View Radio Talk Show, the program begun 38 years ago by the late Marlin Maddoux. Her weekly commentaries air on the Moody Broadcasting Network and the Bott Radio Network. Penna’s columns appear at Baptist Press and the Christian Post blog page. Penna is a Partner in Todd Dexter & Associates, the integrated marketing consulting company founded by her husband, Todd. 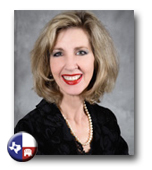 Penna serves on the Executive Advisory Board for Golden Corridor Republican Women. She has served several times, including this year, as emcee for the Dallas March for Life. She graduated from the University of Southern California with a degree in International Relations. She spent 8 years in the banking industry. Penna and her husband Todd have three adult children.